In 1866 tragedy strikes at the exclusive Windfield School when a mysterious accident takes the life of a student. Among the student's circle of friends are Hugh Pilaster; Hugh's older cousin Edward, dissolute heir to the Pilaster banking fortune; and Micky Miranda, the handsome son of a brutal South American oligarchy. The death and its aftermath begin the spiraling circle of treachery that will span three decades and entwine many lives. From the exclusive men's clubs that cater to every dark desire of England's upper classes to the luxurious ballrooms of the manipulators of the world's wealth, Follett conjures up a stunning panorama of intrigue. A Dangerous Fortune brings us characters swept toward a perilous climax where greed, fed by the shocking truth of a young man's death, must be stopped - or the dreams of a nation will die. 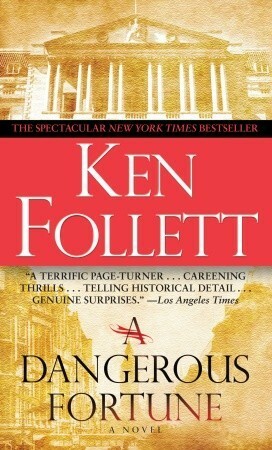 This is the second Ken Follett that I've listened to. Great ,suspenseful story. I'd like to find more like them.